It’s a new year, and you may be standing in your home or business looking over the interior design and wishing for a fresh new look. Luckily, 2019 will be full of exciting trends that can elevate any home or business design with luxury, comfort, and cost-efficiency. SaveMore Plumbing & Lighting is here to serve as your trusted lighting store across Vancouver and Surrey, and our experienced staff will be able to deliver comprehensive advice to ensure you have the best solutions in the industry. Our lighting showrooms are fully stocked to provide a wide range of high-quality options for consumers of all types, from DIYers to contractors and more. Before you begin shopping for to complete your new lighting design, it can help to consider a few of these trends to ensure that your efforts result in long-lasting beauty and value. Today, we’ll begin to discuss a few of these burgeoning styles that may inspire you to completely change the look and feel of your current interior lighting scheme. If you’re ready to find the most luxurious products and styles in the industry, be sure to stop by one of our two lighting stores to begin! Trends seem to leave as quickly as they have caught on, but one approach that continues to grow in popularity is the use of hanging fixtures such as pendant lights. Homeowners, property managers, and contractors all have a vast inventory of these lighting options to choose from, including contemporary, traditional, transitional, natural, and decorative art styles. Each category is full of dynamic light fixtures that are all unique in their design, delivering nearly complete customization for every customer. SaveMore Plumbing & Lighting stocks a full range of hanging lights, including chandeliers of all shapes and sizes. We’re ready to help homeowners in 2019 achieve the best look for their property, and will work with you through every step of your project! Whether you’re looking for convenient bathroom lighting for your home, or you wish to incorporate your beautifying routine in the bedroom, a lighted mirror can prove to be a dynamic light fixture that is sleek, efficient, and aesthetically pleasing. Many homeowners benefit from the ability to install this lighting solution anywhere they please, while businesses in need of commercial lighting solutions can benefit from luxurious looks that take their restroom’s style to the next level. Dealing with limited space? Need an anti-fog option? Looking for varying color temperatures and lumens? Lighted mirrors are a good solution this year! LED lighted mirrors deliver natural-looking light in a format that is both simple in design and easy to implement in the home. Our lighting stores stock a range of these products that you can find online or in our showrooms. Many home and business owners are on the lookout for lighting products that harken back to the days of old, and industrial lighting is one way to infuse some excitement into any design. This trend is popular amongst the steampunk community, but DIYers of all types can benefit from incorporating structurally fascinating light fixtures into their plans. Our Urban Classic lineup, for example, features bold brass and copper fixtures that are as durable as they are vintage. 2019 will likely see a surge in sculptural fixtures that help to add depth and intrigue to any home or business. If you have considered more old-school styles to create a complex lighting layout, SaveMore Plumbing & Lighting is here to help. Browse our collection of residential and commercial lighting fixtures today to find the right fit for your design! 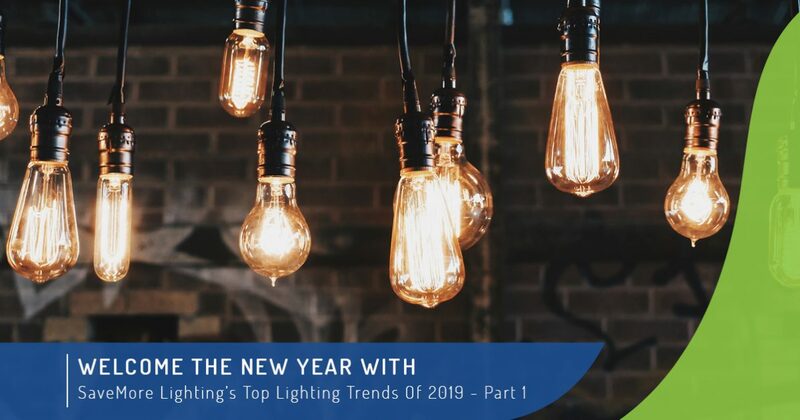 While vintage lighting has evolved to be more refined and polished than ever before, homeowners who prefer simpler designs will typically go the opposite route throughout 2019. Modern lighting trends rely on precision and simplicity to deliver a clean look that easily fits into any decor theme. Commercial and residential customers alike can benefit from our range of low-profile lighting solutions, featuring contrast in a way that is both bold and beautiful. Traditional elements often rely on extravagant designs to achieve a look of luxury, yet many modernists are happy to rely on neutral colors and practical forms for a unique outcome. From the bathroom to the kitchen, commercial and home lighting has evolved to incorporate varying styles to help achieve a high-quality outcome for every individual. Whether you’re hoping to impress customers with a rich, luxurious style or you want your home to look sleek and modern, SaveMore Plumbing & Lighting is here to help! Our lighting stores in Vancouver and Surrey proudly provide all of the fixtures and design solutions needed to take on 2019 and beyond. Contact us today to learn more about our top-notch products, and be sure to check back next time for additional trends to consider for the new year!